Marshall quarterback Chase Litton, left, tosses a pass out to receiver Marcel Williams (9) during a Sept. 16 football game against Kent State at Joan C. Edwards Stadium in Huntington, W.Va.
HUNTINGTON, W.Va. — You could blame it on Mother Nature … or you could just give credit to the Panthers. Visiting Florida International scored 17 points off of three Marshall turnovers and led wire-to-wire Saturday during a 41-30 victory in a Conference USA East Division football contest at Joan C. Edwards Stadium in Cabell County. The cold weather and wet conditions certainly played a part in the Thundering Herd’s misfortunes, but the hosts were also less than stellar in every phase against a Panthers squad that is off to its best start in program history. Marshall (6-2, 3-1 CUSA) fumbled the ball away on the second offensive snap of the game, which allowed FIU (5-2, 3-1) to claim an early 7-0 advantage after Napoleon Maxwell capped a 4-play, 13-yard drive with a 1-yard TD run at the 13:22 mark of the opening period. A quick three-and-out again gave the Panthers possession at their own 34, then the guests marched 66 yards in 10 plays for a 14-point cushion as Alex Gardner scored on a 7-yard run at the 6:59 mark. The Green and White’s only offensive breakthrough in the first half came with 7:37 remaining as Willie Johnson hauled in a 15-yard TD pass from Chase Litton, capping a 6-play, 67-yard drive that cut the MU deficit in half at 14-7. Marshall — which had its five-game winning streak snapped — was never closer the rest of the way. FIU added to its lead with 4:55 left as Alex McGough found Thomas Owens on a 41-yard TD pass, then the same combo hooked up again on a 19-yard TD pass just 31 seconds before halftime — allowing the guests to take a sizable 28-7 advantage into the break. The Panthers held a 246-171 advantage in total yards at halftime, which included a sizable 93-12 edge in rushing yards to go along with being plus-1 in turnover differential. After a pair of defensive stops to start the second half, Marshall’s second offensive drive turned into disaster as a Litton pass was picked off by Brad Muhammad and returned 12 yards to paydirt — giving FIU its largest lead of the day at 35-7 with 6:11 remaining in the third period. The Herd, however, responded quickly as Tyler King capped a 7-play, 74-yard drive with a 26-yard TD run, allowing the hosts to close back to within 35-14 with 4:27 left in the third. The Green and White took over possession less than a minute into the fourth, but Muhammad again picked off a Litton pass that gave the guests possession at their own 23. FIU followed with an 8-play, 64-yard drive that resulted in points as Jose Borregales nailed a 30-yard field goal with 8:15 left in regulation for a 38-14 contest. MU answered with a pair of Litton TD passes, the first of which went for 24 yards to Marcel Williams with seven minutes left. Litton then found Tyre Brady on an 8-yard TD pass with 2:44 left in regulation. Litton also completed a pair of successful 2-point passes to Willie Johnson following each score, which allowed the hosts to get back to within 38-30. FIU recovered the ensuing onside kick attempt and covered just six yards in four plays as Borregales converted a 38-yard field goal with 26 seconds left to wrap up the 11-point decision. 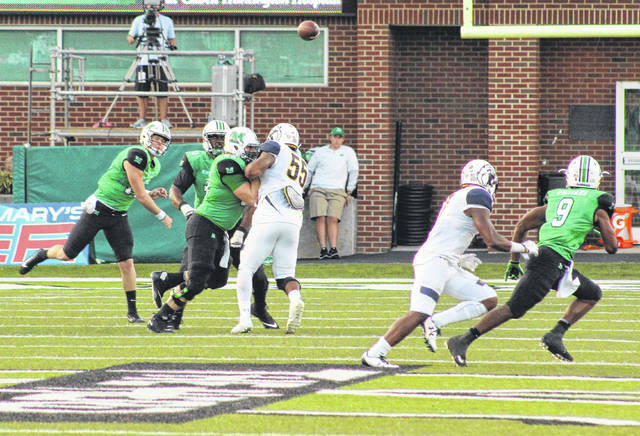 The Thundering Herd claimed a 29-21 advantage in first downs and also posted a 505-401 edge in total yards of offense, but the three turnovers ultimately led to the hosts’ demise. Eighth-year MU coach Doc Holliday gave credit where it was due following the game, but he also brought up the fact that the three miscues really hindered any chance of getting out of Halloween weekend with a victory. Of Marshall’s 14 offensive possessions, three ended in turnovers and another trio stopped because of loss of downs. The hosts punted just twice on the day and also had a pair of drives conclude at the end of each half. Litton — who threw his first interception since the Kent State game in early September — finished the day 33-of-52 for 363 yards, which included three TDs and two picks. MU produced 142 rushing yards on 29 attempts for an average of 4.9 yards per try. Keion Davis led the hosts with 85 yards on 11 carries, while King added 82 yards and a score on 13 totes. Tyre Brady led the wideouts with nine catches for 101 yards and a score, while Williams added 92 yards and a score on nine grabs. Chase Hancock led the Marshall defense with 17 tackles and Malik Gant chipped in 13 stops. Omari Cobb had the lone sack for Marshall, which produced six tackles for loss. Florida International churned out 224 rushing yards on 48 attempts for an average of 4.7 yards per carry. Maxwell led the guests with 93 yards and a score on 11 tries, while Gardner added 71 yards and a score on 19 chances. McGough was 14-of-18 passing for 177 yards and two TD scores. Owens led the receivers with seven grabs for 114 yards and a pair of touchdowns. Muhammad — along with his two interceptions — led FIU with 10 tackles. Bryce Canady also recovered the early first quarter fumble for the Panthers, who did not record a sack in the triumph. Marshall has little time to lick its wounds as the Herd travels to Boca Raton for a Conference USA East Division contest on Friday night against Florida Atlantic. Kickoff is scheduled for 6 p.m.